The Board of Directors for the Greater Reston Arts Center today announced the appointment of Holly Koons McCullough as the Center's Executive Director. Ms. McCullough, who currently serves as the Center's Curator, will keep that responsibility as well. The Board praised Ms. McCullough as uniquely positioned to not only manage the institution and envision its future as part of the "Destination Reston" proposition with the coming of Metrorail, but someone who can articulate and model that vision in ways that are essential for fundraising. "My goal is to lead GRACE to a position of growth and prosperity, allowing the organization to better serve its mission to enrich community life by promoting involvement and excellence in the visual arts," Ms. McCullough said. 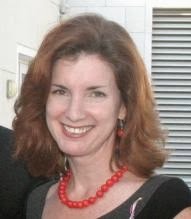 "I intend to bring in exhibitions that inspire and educate, in addition to promoting Reston as a cultural destination. I also hope to expand the reach of our educational programming that currently serves over 20,000 students in more than 40 schools regionally, and take our highly-anticipated annual Northern Virginia Fine Arts Festival to an even higher level of quality and success." Ms. McCullough has a 17-year career devoted exclusively to the visual arts. She served as the Director of Collections and Exhibitions at the Telfair Museum of Art in Savannah, Georgia, in the 15 years prior to her appointment as the Center's Curator. She managed the Telfair's prestigious permanent collection and twelve to sixteen changing exhibitions annually, was responsible for an extensive curatorial budget and staff of six, and pursued grants and fundraising in support of exhibitions, collections, and acquisitions. Moving to the Center in 2012 she inherited an exhibition program largely structured through 2013, but has infused it with her personal choices. She has scheduled upcoming exhibitions featuring nationally-recognized artists and has proposed collaborative installations beyond the gallery’s walls, cultivating a greater awareness of the Center and its mission. As Curator she has gained an understanding of the Center’s operations and built positive relationships with staff, Board Members, and partner organizations. Ms. McCullough holds a B.A. in English and Art History from the University of Georgia and an MA in Art History from the University of Notre Dame. She will assume the Executive Director role January 1. "The Center is a special place, and with the coming of Metrorail we are uniquely poised for growth," said Ms. McCullough. "I am delighted to be working with such a talented staff and engaged Board of Directors to launch the next chapter in the organization's development."